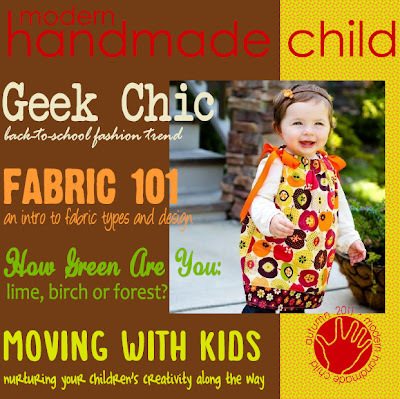 Modern Handmade Child: Autumn 2011 Issue out now! Here at MHC, we have been doing just that. Hot off the virtual presses, our Modern Handmade Child Autumn Issue 2011 is out now! Packed full of Autumn inspiration, this issue is sure to put you in the mood for Fall. Enjoy inspiring interviews, delicious new recipes, the latest handmade trends for back to school fashion and Halloween costumes, quick and easy craft tutorials, tips for living green, and much, much more. Simply click on the cover below to jump into Autumn! Happy 2nd Anniversary, Modern Handmade Child! So happy to be part of this awesome team of creative souls...thanks for having me on board. Here's to many more colorful and inspiring, gorgeous issues (and blog posts).